Matt's horse shows up riderless in Dodge City, and there is blood on the saddle. While Festus and Newly search for Matt, ruthless vigilantes take over. Dr. Galen 'Doc' Adams: For twelve years you've had law and order in Dodge City because one man enforced the law. Now that he's not here, you're willing to give the town away to the first incompetent that comes along with a shot gun and is anxious to use it. One of the most-common themes of Western films and TV shows -- both kiddie and adult -- is defending one's property and way of life against the "evil agro-capitalists" -- the people who drive off the "little fellers" so they can control the land and its potential wealth. The other reviewer doesn't get the point. This episode isn't about cattle rustling. It's about an attempt by business interests (in this case, the Cattlemen's Copper-ative (as Festus mangles it)) to gain control of the grazing lands outside Dodge. This is a fine episode. 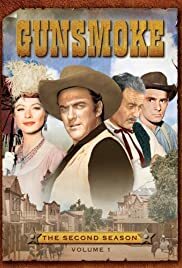 Not only does it make its political and economic points plainly (giving Milburn Stone a great chance to lecture the town folk on their responsibilities), but there's a dozen corpses at the end, a high count even for "Gunsmoke". Whether you prefer social commentary or violent shoot-outs, there's a lot to like in this episode.